The other day I was leaving after a busy shift. As I was just a few feet from the door, a nurse grabbed me and said the patient in room 17* wanted to see me. I turned around, put my bag down and took off my coat, and went into the patient's room. "The nurse said you wanted to see me about something?" I asked. "Yes," said the patient. "I'm sorry, I know you were just trying to go home. But I just wanted to say: thank you." *room numbers have been changed to protect patient privacy. **I can't read the attribution on the bottom, and searching the internets has been unsuccessful. Does anyone know who made the original? 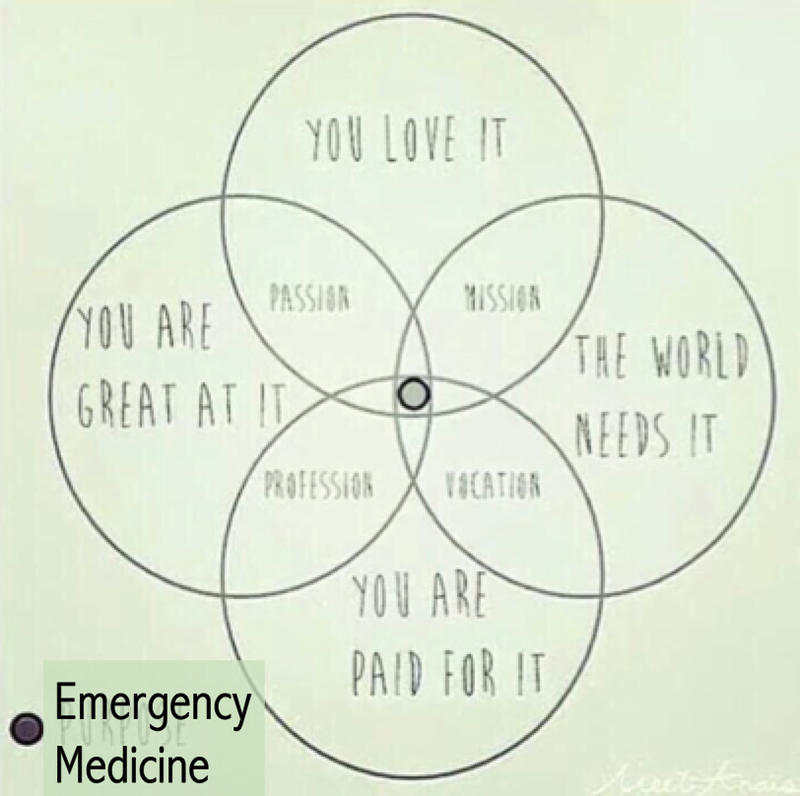 This is a guest post by Cedric Dark, emergency physician at Baylor College of Medicine, who also runs PolicyPrescriptions.org, and Laura Medford-Davis. The Affordable Care Act (ACA or Obamacare) is open for business, presuming that HealthCare.Gov doesn’t crash again this open enrollment period. But since the Supreme Court empowered states to make independent decisions about Medicaid expansion, patients’ questions about how Obamacare affects them can be confusing to navigate. This article attempts to simplify the major decisions states can take - Medicaid expansion, modified expansion, and failure to expand - by presenting them through the lens of a patient and his family living in different states. To the dismay of the law’s creators, not every state has opted into all aspects of the ACA’s coverage provisions. Twenty-four states and DC are expanding traditional Medicaid. Twenty-one states have flat out refused. And a few others have some interesting twists on their unique efforts to provide health coverage for the poor. Figure 1. 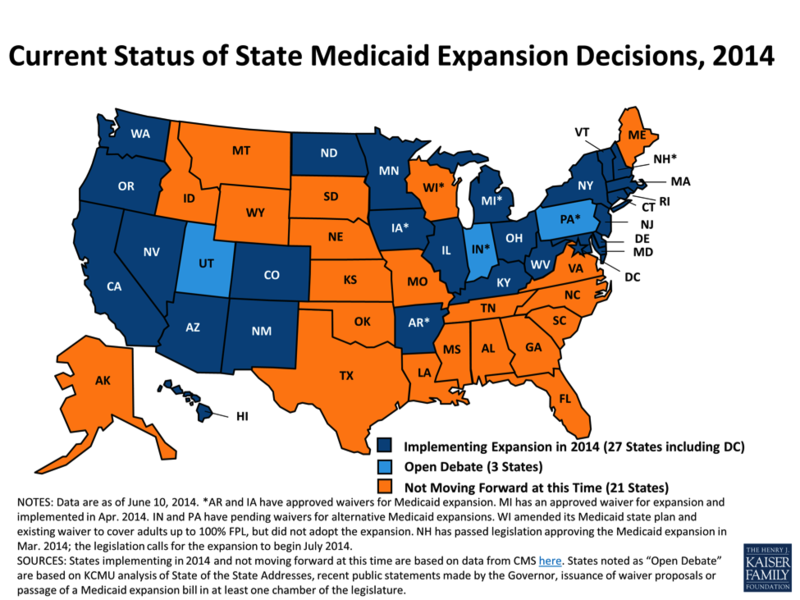 Medicaid expansion map from the Kaiser Family Foundation. The two major ways the law aims to expand coverage for uninsured Americans includes expansion of Medicaid to families below 138% of the federal poverty level (FPL) and private coverage through health insurance Marketplaces for everyone else. Prior to the ACA, only eight states and the District of Columbia covered adults with dependent children at or above 138% FPL, and only Vermont and the District of Columbia covered adults without children at the level mandated by the ACA. Over 17 million Americans are now eligible for tax credits to purchase insurance in the ACA Marketplaces and an estimated 14 million Americans living near or below the federal poverty level would have become eligible for Medicaid as of January 1, 2014 if all states chose to expand. For a family of three, the maximum income to qualify for the Medicaid expansion is $27,310. Figure 2. Income Thresholds for premium credits for Medicaid coverage. (Source: Healthcare.gov). After the Supreme Court ruled that Medicaid expansion was optional for states, some states decided to participate and others chose to decline the expansion. Patients have asked us on more than one occasion: “Can I get that Obamacare?” The response from emergency physicians depends, of course, on the state in which you practice. In this piece, we explore how to answer the above question by considering coverage options available to a low-income family of three. Consider the following scenario: your patient, Benjamin, is a second grader whose parents – Tom and GiGi - are anxiously awaiting the results of an ultrasound for right lower quadrant pain. Tom, the Smith family’s breadwinner, earns just over $16,000 working as a high school football coach. His wife GiGi works part-time for a boutique clothing store and earns almost $9,000 a year. They ask you whether or not they qualify for Obamacare. Twenty-four states and the District of Columbia are expanding Medicaid to all individuals in households earning less than 138% FPL by implementing the ACA. We describe the changes a family can expect in most of these states by looking at Arizona as an example. Prior to the ACA, school age children in Arizona were eligible for Medicaid if their household income was below the FPL. KidsCare, Arizona’s CHIP program, covered children in families making up to about $39,000 (twice FPL) with inexpensive income-based premiums and copays. Parents in Arizona who earned at the FPL were eligible for Medicaid in 2013. However, Benjamin and his parents made slightly more than last year’s $20,702 upper limit for Medicaid for a family of three, so Tom and GiGi did not qualify. Adults without children in Arizona were theoretically eligible at this level too, but have not been able to actually enroll since 2011 due to an enrollment freeze. So how does the ACA impact your patient? What can you tell him and his family? Arizona expanded Medicaid under the ACA in 2014 and now coverage is available to adults like Tom and GiGi where it was not before. Your patient and his parents can now all enroll in Medicaid. As a little bonus, the literature shows that when children’s parents are also enrolled in Medicaid, children on Medicaid get more primary care services. Hopefully then, Tom, GiGi, and Benjamin can get care in the primary care setting, instead of having to visit the emergency department for routine care. Twenty-one states have explicitly declined to expand Medicaid under the ACA. In these states, over 24 million people will remain unable to qualify for Medicaid either due to earning over specific income thresholds or facing restrictions based on immigration status. Our example describes the experience of families in the Commonwealth of Virginia, a state whose previous Governor and Legislature declined to expand Medicaid. In 2013, Benjamin qualified for CHIP since his parents made just less than the Virginia CHIP limit of $26,000. But his parents made too much money to qualify for Medicaid themselves because the eligibility level was under $6,000 for a working family of three. In 2014, Virginia increased that limit to about $10,000. However, your patient Tom, and GiGi still make too much to qualify. They can, however, get a federal subsidy for private insurance through the ACA Marketplaces. Health insurance premiums would have cost them $5,600 per year, but the subsidy covers the majority, allowing them to buy a private health insurance plan for just $500 per year. They will still owe up to $4,500 in out-of-pocket copays and deductibles when they visit the emergency department or their physician’s office. Virginia may eventually accept the Medicaid expansion. Without it, there is a Medicaid coverage gap where working parents earning $10,000-$19,530 make too much money for Medicaid but not enough for Marketplace subsidies. Arkansas and Iowa have both received special permission from the federal government to try a modified Medicaid expansion plan in which low-income residents would use federal funds to purchase private insurance plans. Our example describes the experience of families in Arkansas, the origin of the private option. Since this family earns less than $27,000, Arkansas’ Medicaid program will pay all of the premiums and copays to enroll them in private insurance plans. With it, they can now access all of the primary care physicians that accept their private plan, not just those that accept Medicaid plans. Their primary doctor and any emergency physician that treats them will be reimbursed at rates negotiated with private insurers. Most doctors and hospitals expect to negotiate higher reimbursement rates relative to traditional Medicaid (although less than employer-based private plans). Arkansas and Iowa serve as examples of bipartisan compromise on the fundamental issues regarding the Affordable Care Act and its Medicaid expansion. Several other states are looking into the private option as potential ways to break the political gridlock which is hampering low-income Americans from accessing health care. Three states still are actively debating whether or not to adopt the Medicaid expansion. Decision-makers in Indiana and Pennsylvania have contemplated expanding Medicaid via an Arkansas-style private option but have yet to finalize these plans. From the perspective of low-income uninsured patients, the ACA provides several different options to gain coverage. In 24 states plus the District of Columbia, people earning less than 138% FPL will now be eligible for traditional Medicaid. Two additional states – Arkansas and Iowa - are expanding Medicaid in a creative political compromise known as the “private option” where beneficiaries receive private insurance coverage using Medicaid money. However, in the 21 states opposed to expanding Medicaid, nearly 5 million Americans will remain uninsured and stuck in the Medicaid gap. The remaining uninsured, who earn at least $19,530, will qualify for subsidies in the ACA Marketplaces. The first step in helping patients realize what assistance is available is knowing where your state stands on the ACA Medicaid expansion. After that, the best course of action will largely depend on family size and income. It is in your patient’s best interests to be open and honest about discussing their personal financial situation once they ask you about their options for health care coverage. Refer them to HealthCare.Gov to explore all their options and to get information specific to their situation. *Enrollment was closed to new beneficiaries the entire year. New Jersey closed enrollment to people earning between 133-200% FPL. a Dollar values for a family of three. b Amounts in parentheses indicate expanded eligibility levels available via CHIP funding. c Coverage is not available for this group regardless of income. Adult income eligibility limits at application as a percent of the Federal Poverty Level FPL), January 2013. Kaiser Family Foundation. Available at: http://kff.org/medicaid/state-indicator/income-eligibility-low-income-adults/. Accessed Aug 3, 2014. State-by-state estimates of the number of people eligible for premium tax credits under the Affordable Care Act. Kaiser Family Foundation. Available at: http://kff.org/report-section/state-by-state-estimates-of-the-number-of-people-eligible-for-premium-tax-credits-under-the-affordable-care-act-table-1/ Published November 5, 2013. Accessed June 4, 2014. Number of uninsured eligible for Medicaid under the ACA. Kaiser Family Foundation. Available at: http://kff.org/statedata/ Accessed June 4, 2014. Income levels that qualify for lower health coverage costs. HealthCare.gov. Available at: https://www.healthcare.gov/how-can-i-save-money-on-marketplace-coverage/ Accessed June 4, 2014. Where are States Today? Medicaid and CHIP Eligibility Levels for Children and Non-Disabled Adults as of April 1, 2014. Available at: http://kaiserfamilyfoundation.files.wordpress.com/2014/06/7993-05-where-are-states-today-fact-sheet-june-2014-tables.pdf. Accessed Aug 3, 2014. Governor Brewer's Medicaid plan: The conservative choice for Arizona. Official Website of Arizona State Governor Janice K. Brewer. Available at: http://www.azgovernor.gov/Medicaid.asp Accessed June 4, 2014. Gifford E, Weech-Maldonado R, Short PF. Low-income children’s preventive service use: implications of parents’ Medicaid status. Health Care Financing Review. 2005; 26: 81-94. Kaiser Family Foundation subsidy calculator. Kaiser Family Foundation. Available at: http://kff.org/interactive/subsidy-calculator/ Accessed June 4, 2014. Terry McAuliffe’s push to expand Medicaid rankles the GOP lawmakers he seeks to woo. The Washington Post. Available at: http://wapo.st/1mx4hGs Published January 20, 2014. Accessed June 4, 2014. Interactive: A state-by-state look at how the uninsured fare under the ACA. Kaiser Family Foundation. Available at: http://kff.org/interactive/uninsured-gap/ Accessed June 4, 2014. Arkansas’ Medicaid experiment, key to Obamacare expansion, on ropes. The Washington Post. Available at: http://wapo.st/1h3pE2j Published February 10, 2014. Accessed June 4, 2014. Current status of state Medicaid expansion decisions. Kaiser Family Foundation. Available at: http://kff.org/health-reform/slide/current-status-of-the-medicaid-expansion-decision/. Accessed Aug 3, 2014.